Tag Archives for " nectar collector "
Put simply, a nectar collector is a slim, vertical vaporizing tool that utilizes water filtration. This innovative concentrate tech takes everything you love about a dab rig and turns it into a fresher, more sophisticated experience. A nectar collector generally comes in a kit-like box with all parts disassembled. Here’s what to expect when you unbox a brand new nectar collector. Water Chamber: Water filtration is why nectar collectors deliver smooth and silky dabs. The central piece of a nectar collector is its water chamber. The most common (and most affordable) method of water filtration is a simple open-ended stem and dome combo. The fancier nectar collectors may include a diffused stem or even a shower head or comparable perc. Neck: The neck/mouthpiece of a nectar collector is usually a slim straight tube that connects to the water chamber via a frosted joint. In high-end nectar collectors, this piece may contain an extra perc for filtration. Tip: The tip of a nectar collector connects to the water chamber with a joint as well. The most basic kits come with a glass tip, but you’ll commonly see titanium tips as well. Quartz tips can be found as well, and are a good choice if you like the clear look but want to retain heat and resist cracking better than glass. Some kits come with a keck clip to hold the tip and water chamber together for extra security. The real question is, how do you use one of these contraptions? Luckily, it’s pretty simple. Fill the main chamber from the top. Fill it slowly and steadily, until the chamber is about ⅓ to ½ full. and cause cracking when heated. Insert the glass, titanium, or quartz tip into the bottom of the joint, and secure with a keck clip if available. Use a push-and-twist motion to ensure a snug fit. Prepare your concentrate by placing your desired amount in the dab dish and placing the dab dish on a flat surface free of surrounding objects. A counter or table is best. 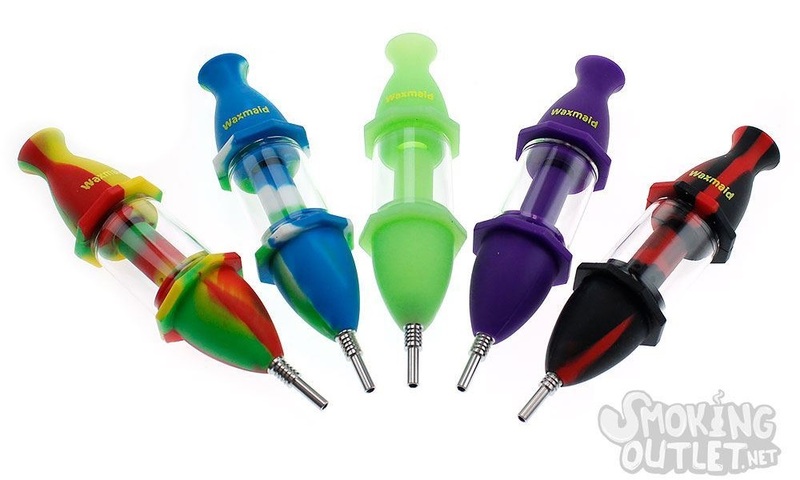 The basics of using a nectar collector are pretty simple after you use it once or twice. But here are a couple of pointers to help you get the most out of your experience! To smooth out your dabs even further, try starting your inhale as you finish leaning down to the counter or table. Before you actually touch the heated tip to the concentrate. This adds some cooler air to your hit, which then receives further cooling by the water filtration in the chamber. Nectar collectors are an elegant way to get the best flavor from concentrates, as well as more precisely dose your sessions. There’s also the cost advantage: nectar collectors are definitely cheaper than your average dab rig. Add in their portability, and you’ve got the perfect companion to your best concentrates.